Rick Braun earned his first merits with Reo Speedwagon, War, Tom Petty and Sade. He started his solo debut with Intimate Secrets (1993), followed by Night Walk and Christmas Present (1994). His popularity grew with Beat Street (1995), Body And Soul (1996), Full Stride(1998), Kisses In The Rain (2001), Esperanto (2003), Yours Truly (2005), Sessions Vol.1 (2006), RnR (2007) and in 2009 All It Takes. Admired were especially his collaborations with Boney James (Shake It Up) in 2000, tagged as smooth jazz event of the year and with Richard Elliot (RnR). Both created with their manager Steve Chapman and industry veteran Al Evers the label ARTizen Music, which is now acquired by Mack Avenue Records. Besides Peter White is Rick Braun certainly one of the busiest musicians in the smooth jazz genre. Currently he is touring with the project Jazz Attack featuring Rick Braun, Richard Elliot and Jonathan Butler. Richard Braun's new album was produced by Richard and Philippe Saisse. “What I’ve always loved about Philippe’s music is the continental, European melodic sense he brings to everything he does,” says Braun, who counts 1997’s Que Pasa, the Saisse-produced Gato Barbieri album, as one of his all-time favorite recordings. Herb Alpert is Rick Braun's great idol. "When I was about 10 and learning to play trumpet, I spent hours playing along with Herb Alpert," Braun says. "Songs like 'The Lonely Bull' and 'Tijuana Taxi.' Herb made trumpet playing fun, and I think his song-writing style was a big influence." In consequence the starting song Tijuana Dance? (the title was suggested by Dave Koz) is Rick's musical tribute to this stellar trumpet player he adores since his youth. Rick's sonorous trumpet rises on the stomping beat and a fulminate horn arrangement. Puerto Allegre Jam features Marc Antoine on guitar, Saisse on piano and Vanessa Falabella on vocals. "It's a little bit of a departure for me, but its roots are still in R&B," says Braun, adding that Puerto Allegre Jam is his favorite track on the CD. "I visited Puerto Allegre while on tour with Rod Stewart in the early '90s. I guess I owe Rod a debt of gratitude." A modern dance floor hit Rick owes the change of time. Christiane, a collaboration between Rick and Jeff Lorber, is named after Rick's German born wife. The melody is performed by Rick on flugelhorn, the adds on muted trumpet. All It Takes has that melancholic moody flair which can only grow in the city of Paris. It was the first tune that Philippe Saisse presented Rick in his studio. She's the One co-wrote Rick Braun with Tim Gant and is dedicated to the late Freddie Hubbard. Tim Gant co-produced Brian Culbertson's album Secrets, performed on Michael Manson's album Up Front and also on Terisa Griffin's CD My Naked Soul. Philipee Saisse's Melancholy encompassed in Rick's muted trumpet shines through I Got Your Back. Ever Changing World displays Rick's stately Flugelhorn interpretation in contrast to the restless electronica soundscape performed by Philippe Saisse. Sleeveless in Seattle, a title for a song, a title for a take of life. Catch the sun, good locations and the terrific music of Rick Braun. Enjoy your life. Berlin, main capital of Germany, is a city with a great range of nightlife and entertainment. Rick captures the pulsing spirit of this modern exuberant munificent megacity in a dynamic song. Freddie Was Here is Rick's second reminiscence to the late Freddie Hubbard, Rick's major influence. “There was no player who was ever as confident, creative or innovative. He took improvisation to a whole new level and I have always considered his album First Light with George Benson and Hubert Laws to be the original urban jazz album." A sensible ballade keeping emotion in mind. You can call All It Takes everything but call it foremost good music. 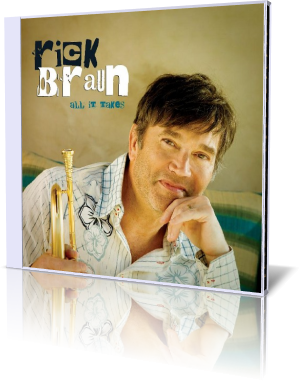 Rick Braun's album is a reference for all musicians.